AIR-SHIELD LOW TEMP self-adhering air/vapor and liquid moisture barrier is part of a total W. R. MEADOWS system to complete the building envelope. It is a roll-type product that is nominally 40 mils thick and is ideal for cold weather applications. The membrane’s controlled thickness is fabricated from cross-laminated polyethylene bonded to specially modified asphalt. This unique, self-adhesive membrane, protected by a special release paper, is strong and durable. It remains flexible when surface mounted and will adhere to most primed surfaces at minimum temperatures of 20˚ F (-7˚ C). The membrane provides excellent protection as a tough barrier or flashing that won’t shrink, sag, dry out, crack, or rot. It offers excellent resistance to punctures during installation. The self-healing characteristics of AIR-SHIELD LOW TEMP facilitate recovery if minimal damage is sustained under normal use applications, i.e. when penetrated with self-tapping screws or nails. AIR-SHIELD LOW TEMP is designed for a variety of uses. Primary applications include cavity wall and masonry wall construction. AIR-SHIELD LOW TEMP works equally well as an air, vapor, and liquid moisture barrier on precast concrete, cast-in-place concrete, masonry (concrete block), interior and exterior gypsum board, Styrofoam, primed steel, aluminum mill finish, anodized aluminum, primed galvanized metal, drywall, plywood, and OSB. Low permeability – prevents the transmission of air and inhibits moisture vapor through porous building materials. Superior adhesion, even down to 20˚ F (-7˚ C). Cross laminated polyethylene film has excellent tensile strength, elongation, and tear resistance. Modified membrane is flexible at low temperatures. Excellent adhesion to prepared substrates of precast concrete, cast-in-place concrete, masonry (concrete block), interior and exterior gypsum board, Styrofoam, primed steel, aluminum mill finish, anodized aluminum, primed galvanized metal, drywall, and plywood. Self-healing characteristics facilitate recovery if minimal damage is sustained under normal use applications. Standard and extra-low temp versions also available. AIR-SHIELD LOW TEMP is packaged in rolls measuring 38.5″ (.97 m) x 75′ (22.86 m). AIR-SHIELD LOW TEMP can also be cut to desired width. 18″ x 75′, 20″ x 75′ and 24″ x 75′. Coverage is approximately 240 ft.2 (22.3 m2). Net coverage when lapped 2.5″ (63.5 mm) is 225 ft.2 (20.9 m2). AIR-SHIELD LOW TEMP should be stored palletized and protected from rain and/or physical damage. Do not store at temperatures above 90º F (32.2º C) for extended periods of time. Do not leave membrane exposed to direct sunlight. Do not double-deck pallets. Store away from sparks or flames. Outdoors, store AIR-SHIELD LOW TEMP on pallets and completely cover. Exceeds the requirements of the Massachusetts Commercial Energy Code for Building Envelope Systems. AIR-SHIELD LOW TEMP provides an effective barrier to air exfiltration and infiltration, reducing condensation within the wall assembly and increasing the efficiency of a building’s mechanical system. Wet insulating materials lose much of their “R” factor performance characteristics, reducing the energy efficiency of the structure. W. R. MEADOWS thermal and moisture protection products play a key role in maintaining the structure’s energy efficiency and aiding in the integrity of other structural systems, such as insulation. ASTM E154 40 lbf (178 N) Min. Application Temperature: 20˚ F (-7˚ C) Min. Surface Preparation … All surfaces to be protected must be clean, dry, frost-free, and smooth. Remove any sharp protrusions and repair all defects. Prepare substrate per manufacturer’s instruction prior to application of membrane. All surfaces to receive AIR-SHIELD LOW TEMP must be clean of oil, dust, and excess mortar. Strike masonry joints flush. Concrete surfaces must be smooth and without large voids, spalled areas, or sharp protrusions. Concrete must be cured a minimum of 14 days and must be dry before AIR-SHIELD LOW TEMP is applied. Where curing compounds are used, they must be clear resin-based, without oil, wax, or pigments. Surface Conditioning … All surfaces to which AIR-SHIELD LOW TEMP is to be applied must be addressed. MEL-PRIME™ W/B water-based adhesive can be used when temperatures are above 40º F (4º C). Use MEL-PRIME adhesive in colder weather and at higher application temperatures for maximum adhesion. MEL-PRIME may be applied with a roller to an area that is to be covered the same day. Uncovered areas must be re-applied with MEL-PRIME the next day. See product container for complete application, drying information and precautions. Application Method … AIR-SHIELD LOW TEMP can be applied at minimum temperatures of 20˚ F (-7˚ C). Apply membrane to primed surface by removing the release paper and rolling the membrane firmly into place. Remove the release paper only as the membrane is being applied. Ensure the membrane is fully adhered and remove all wrinkles and/or fish mouths. Cut the membrane with a utility knife to detail around protrusions and masonry reinforcing. Seal all end laps and protrusions with POINTING MASTIC. Overlap subsequent courses of membrane a minimum of 2.5″ (63.5 mm). Vertical terminations of AIR-SHIELD LOW TEMP should either be tied into the wall system or mechanically fastened with TERMINATION BAR from W. R. MEADOWS. AIR-SHIELD LOW TEMP is not designed for permanent exposure. 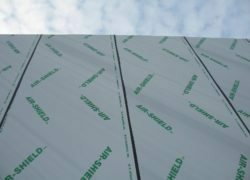 Good construction practices call for application of insulation as soon as possible to protect the air barrier. Cleanup … Tools, etc., can be cleaned with mineral spirits, paint thinner or aromatic solvent. No adverse effects expected with normal product use. Cotton work gloves and safety glasses are recommended. Refer to Safety Data Sheet for complete health and safety information. MEL-PRIME W/B … Water-based adhesive prepares concrete surfaces for AIR-SHIELD LOW TEMP membrane application. Ready to use; requires no additional mixing. MEL-PRIME W/B emits no unpleasant odors and works with all waterproofing membranes from W. R. MEADOWS. Can be applied easily by manual spraying or with a roller. VOC-compliant. MEL-PRIME W/B is ideal for use at temperatures of 40° F (4° C) and above. MEL-PRIME … This solvent-based adhesive can be used at temperatures down to 0° F (-18° C) and above. Can be applied by roller. POINTING MASTIC … Used for sealing top edges of TERMINATION BAR. Coverage: Approximately 200 lineal ft. (61 m) per gallon (3.79 L) when used as directed. Packaging: 5 Gallon (18.93 L) Pails or 29 Oz. The rubberized asphaltic membrane component (soft black side) may not be compatible with most polyurethanes or silicones. W. R. MEADOWS offers a line of approved products as part of our complete system. Please reference the appropriate detail for your specific application. When used with other products than recommended, ensure compatibility through either testing or written approval from the manufacturer.